The Community Farming Project is based in the Akuapem Hills, our most rural region in Ghana. This project is in the early stages of development and currently should be combined with another project like teaching, care or building work. The project consists of a small farm and garden, located just ten minutes away from the Akuapem Hills regional office. Volunteers are responsible for helping to maintain all aspects of the farm and garden including animal care, crop growing, flower production, herb cultivation and land management. They also arrange school trips to the farm to educate the local children. Produce which is grown in the garden includes small quantities of oranges, plantain, papaya, carrots, onions, yam and herbs which are used as remedies for medicinal purposes. The garden is also home to rabbits, guinea pigs, geese and, once the pond is complete, fish. Volunteers arrange trips for local schools to visit the site. 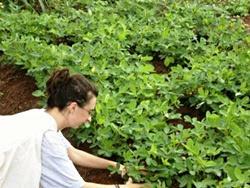 Children are then educated on the process of growing crops in a sustainable environment. They also learn how to take care of animals and how to identify seeds and produce herbs. Volunteers receive training from local specialists in the different techniques involved and have an agricultural text-book which is part of the curriculum to use with the school children.